Google Analytics provides an in depth statistics that help us to perceive and enhance our website traffic. Google webmaster tool is an advanced search analysis tool that helps us to plan and evaluate our SEO campaign. Both are amazing tools for webmasters and site owners. You know what, both Google webmaster tools and Google Analytics lets you to share access. Here we will see why and how to share Google webmaster tools and Google analytics account with someone. Why and to whom to share account access? Why to share Webmaster tools? If you are in a tie up with any SEO company then first thing they ask for is your webmaster tools account that is associated with your website. By sharing your webmaster tools account, the consultant or SEO Company can find out all your previous website data. Also it helps them to recognize the entire problem behind your site and rectify it with right solutions. Why to share Google Analytics account? There are website owners who do not know or use Google Analytics and as a SEO company you can share the Analytics account with your clients. By understanding the daily traffic estimates in Google Analytics, they will come to know how much effort you put in their site. Your clients will know where traffic comes from and how long a visitor stays in their website. By analyzing all the data they can step forward and make a strategy on converting their visitors in to leads. Only verified owners can manage and add new users in webmaster tools account. Login to your webmaster tools account and you will see all your verified websites. Now you will see manage site to your right hand side. Just drop down and select add or remove users. (OR) when you are in site dashboard, click on the geared icon at the top right corner and select users and site owners. Now again to your right hand side you will two options that is manage site owners and add new users. If you wish to share your Google webmaster tools account restrictedly with someone then there is an option. Select add new user, enter their email address and set permission to “restricted”. If you set full user then they can view, access and make changes to your site settings, but they cannot add or remove owners and users. Only site owners (that is you) will have full permission to perform site actions and manage additional site owners and users. Look at the image below for users permissions in Google webmaster tools account. Learn more about it here. Hope this helped you with sharing Google webmaster tools accounts. Now we will see how to grant access to Google Analytics account. Just like webmaster tools user permission, Analytics also has different levels of user permission. So you don’t need to worry about granting access to the people that you don’t trust. Login to your Google Analytics account and select your web property. Now at the right hand top corner you will see admin, just select admin. You will now see three columns such as account, property and view. Now select user management under accounts, enter the email address of the user that you wish to grant access. Now set the permission for the user that is you can make the user to manage users, edit, collaborate, read and analyze. Manage users – Assign this option and a user can manage only your Analytics account users. That is he or she can only add or remove further users and set permissions for them. Edit – Just like an administrator this user will have full permission to add accounts, delete accounts, add, edit and view properties, filters, goals and report data. But he or she will not have the access to manage users. Collaborate – He or she can edit dashboard, can create a personal asset, share them and collaborate with other assets. Read and Analyze – This user will have permission to view report, configure data and control data. 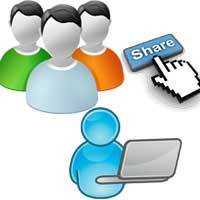 Can create a personal asset, view shared assets, but he or she cannot collaborate with shared assets. Learn more about Google Analytics user permission here. After assigning the user roles, add them. Also you can notify the user by email. Hope this post helped you to share your Google Analytics and webmaster tools account. Tell us what you think and to get more updates subscribe to our blog feeds.